TRX is the perfect tool for building superior muscular balance, joint stability, mobility and core strength. It allows individuals of different fitness levels to work out in the same environment; everyone from the health-seeker to the competitive athlete can take part in the TRX sessions, as the equipment can be instantly adapted to suit all abilities, simply by adjusting the stance or positioning of the user to increase of decrease resistance. The TRX is not only an excellent tool for improving strength, but it can also improve your posture, help prevent injuries and even increase your metabolic activity. The TRX sessions can be adapted to benefit any specific sport, or simply for a full-body workout in a muscular endurance session, or for cardiovascular conditioning. Most importantly, it’s fun to use and incredibly rewarding! See the TRX in action! Yes. The user has complete control over the amount of bodyweight resistance, the angle of the body and their stance and positioning – all of which can increase and decrease the difficulty and strenuousness of TRX. This means it can be used by those who are just beginning an exercise routine, as well as by professional athletes. 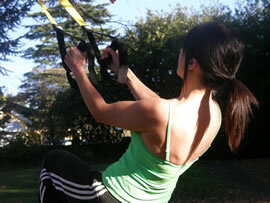 Furthermore, Suspension Training can benefit those who have difficulty with movement. Traditional weight training often only works one muscle at a time, which is contradictory to the normal coordinated muscle effort used to complete most activities. Focusing on only one muscle at a time is more likely to lead to overuse injuries and muscular imbalances, as well as potentially limiting strength and movement gains. Suspension Training allows for the use of multiple planes of motion, and works multiple muscles and joints simultaneously. I’ve heard the TRX® is great for rehabilitation and physical therapy after an injury? Many physical therapists are currently using the TRX to help their patients recover from various injuries. The ease of adjusting resistance, functionality of using body weight and the closed kinetic chain nature of many of the exercises make it a very powerful tool for this type of use.